My Life with Evie and William: Revival! My first Guest Blog! "What did people think about you cloth diapering when you first told them?" Revival! My first Guest Blog! "What did people think about you cloth diapering when you first told them?" Why would you want to use cloth diapers?! Ew! Save yourself some time and effort! Why?! When we told people we wanted to use cloth diapers we were generally met with negativity and scepticism even from our closest friends and our own parents. No one understood why we would make such a strange choice. Generally, our sceptics fell into two categories: The first, the older generation, who had experienced old school cloth diapers, were enchanted by the “ease” of disposable diapers. They still envisioned flats (which do work for some people), diaper pins and rubber pants. They saw hassle and leaks and backward steps into the dark days of yore. Our family surprisingly provided the majority of the vocal opposition; they all swore we would be back in disposables by the end of the month. In the second group, our peers, we were first among our close friends to have a baby, so they were mostly ignorant of the whole debate. They generally greeted our unconventional choice with polite disinterest and moved on, not understanding why a) we would bother and b) it was so exciting. There was the problem of the perception of difficulty with them also, but they were very quick to come around with a quick demonstration of the simple (AppleCheeks) system we showed them. Likely, they were more open-minded because our generation has been saturated with the notions of environmentalism and nature conscious practices. 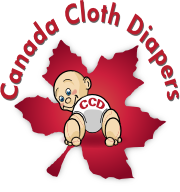 I am overjoyed to say that in the 16 months since we have been cloth diapering, there has been a dramatic change in opinions. Every baby born (or waiting to be born) to one of our close friends or family now has an AppleCheeks diaper on their bottom (or waiting for them). We have also converted some of our new “parents” friends to the cloth world. Even our parents (ok, maybe just our mothers) are comfortable with and have changed many a cloth diaper. They also, theoretically, understand the washing process, but I guard my stash too closely for them to ever have a chance! What would I say to those considering cloth? Thanks for being my first guest blogger Erin! Thanks for asking me Sahra! 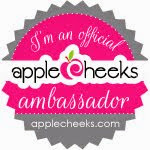 Check me out on the AppleCheeks blog!